Since I currently run the 54 Ford Club of America, I have a small mountain of literature, etc pertaining to 54 Fords. One of the real gems of the collection is the complete, bound set of the Rouge News for the 1954 calendar year. 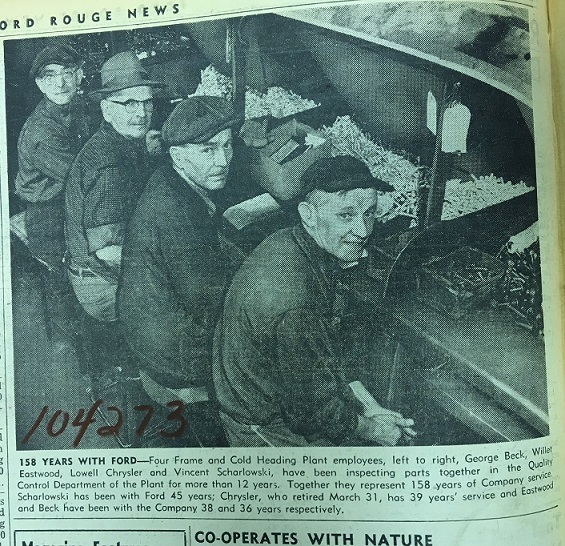 This was the factory newspaper that was distributed free to all employees at the Rouge plant. I came across this photo the other day and immediately made the Model T connection. The gentlemen in this photo are all long time Ford employees who's employment dates back to the time of the Model T.
The man on the right had 45 years of service with Ford in 1954, which makes him a 1909 Ford employee. I'm no Ford historian, but I assume he would've at least been somewhat acquainted with Henry with a start date like that. Also interesting is that one of them has a surname of Chrysler. I wonder is he was kin to Walter P.
When I hired into General motors in 1977 I immediately noticed the plumb job was the two-man rotating crews that operated the overhead cranes that traveled along the I-beams 50 feet above the shop floor- 4 hours operating the crane, then 4 hours on the floor hooking up and moving dies or rolls of steel for the presses. I thought I would apply for that job and checked the seniority list to see how long the wait would be. The guys running the crane in my department in 1977 had hired in in 1923 and 1925! My grandfather worked at Buick from 1911 until 1960. The overhead valve V8 that Ford introduced that year was a faulty engine. Most of the guys in my club, who want to retain a y-block, replace it with a 292 or a 312 and simply paint them in 1954 engine colors. It's really hard to tell the difference. Still...$90 for a Sunliner was a good deal, even back then. The really good ones are selling in the $30K range now...average ones in the high teens and low twenties. That's expensive, but nowhere near what other 50's era convertibles are going for. I paid $900 for my tudor sedan in 1986 (still have it) which was a lot of money for that body style, but it had only 11K miles on it and a perfect body. It was essentially a new car. 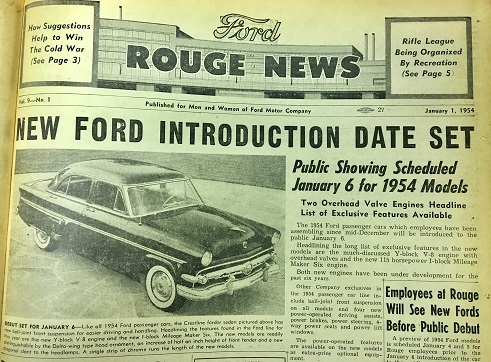 In addition to the overhead valve V8, the 54 Ford had a modern, unequal-length A-arm, ball-joint front suspension, optional power steering, power brakes, power seat and several other modern amenities. When they're in excellent mechanical condition, they're excellent vehicles, capable of running down the highway with modern traffic. And, although the greater antique car public is just now starting to discover them, prices for all the models are very cheap compared to other 50's models. The changes a person must've seen from the brass era to essentially modern cars...it really is sort of mind-boggling. 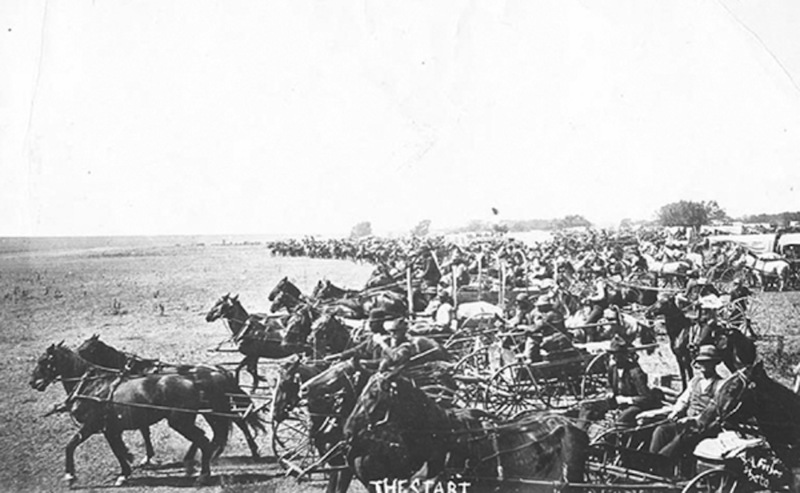 My mom's grandmother was born in the 1880's and took part in the Oklahoma land rush with her parents. 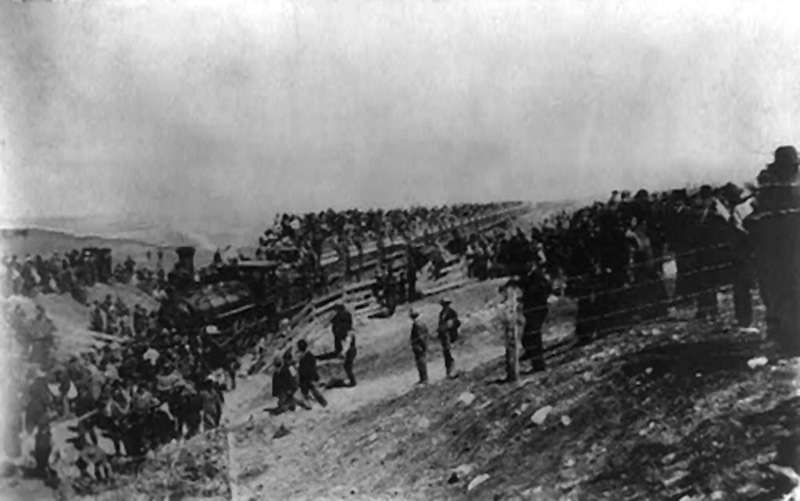 They later crossed the Red River at the TX/OK border using a team of oxen. She passed in 1990 at over 100 years. I was fortunate to know her well and marvel at her stories from what seemed like a different universe. She seemed unphased by the way the world had changed around her. Jim...I'd forgotten about the Bennett days until you mentioned it. I bet these guys hadn't forgotten though. Tough stuff. I remember seeing that movie back when it came out. My great-grandmother said they weren't one of the "Sooner" families who cheated. She said her dad did it the right way and ended up missing out on the choicest land. She was a tough lady who didn't look the part. I always thought she was the spitting image of that cartoon grandma who was Tweety-Bird's owner. She even sounded like that. Her first husband was shot and killed during the Great Depression while shop-lifting a loaf of bread from a grocery store. Her take on it was that it was, of course, very sad and devastating to the family, but that the store owner was within his rights for doing so. Bill French had a 54 Ford and once when he put his dog in the trunk the dog went through a rust hole and got out! The floorboards were also very rusty by the clutch and brake pedals. One day in the summer of 1960 we would drive it through the Little Salt River.The water was about a foot deep and 20 or so mph it would cover the inside of the car!!! We used to do really dumb things but we had fun!! Bud in Wheeler,Mi. Don, do you know which land rush it was? 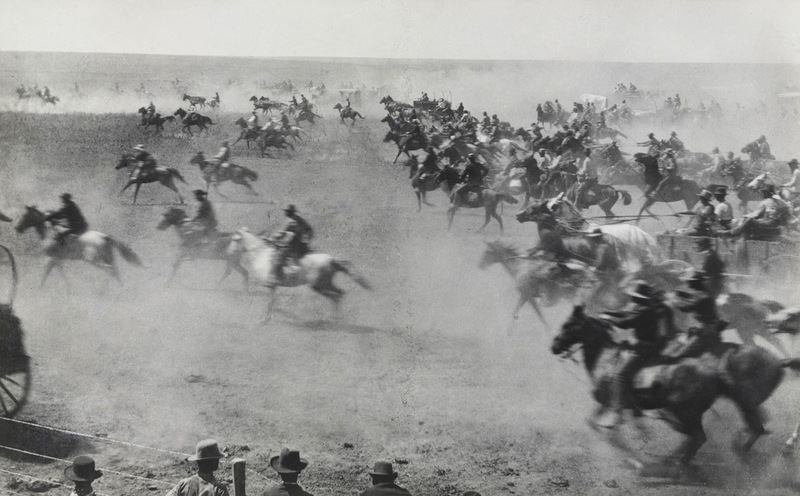 The first was in 1889 and opened up the counties around Oklahoma City. 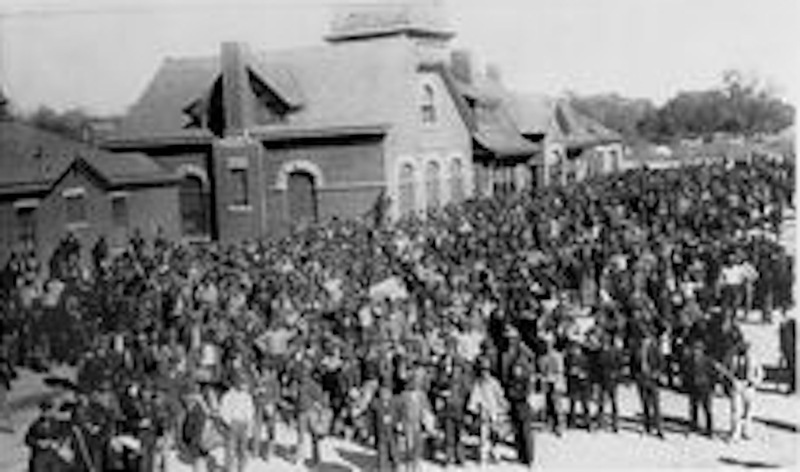 The second was in 1893 and kicked off at the state line five miles from here. The new counties opened in the 1893 run were designated as K, L, M, O, P, Q. County K is still Kay County. Photographer Thomas Croft set up a camera platform on the grounds of Chilocco Indian School, which is on the IT side of the state line. A cannon shot was supposed to signal the start at noon on September 16, but somebody "jumped the gun" and the lieutenant in charge fired the gun a few minutes early. I never understood why families used wagons for this. Seems like you'd be better off on one fast horse. I should've asked my great-grandmother. Steve...I don't know which one it was. I can probably find out though, from some in the family more schooled on my mom's side. I've concentrated more on my dad's side in my genealogy studies. My dad's mom was a Wills. They came to Texas in the Republic of Texas days. Her cousin was Bob Wills. These bad copies are all I could find online. Rock Island line at Caldwell, September 16, 1893. Santa Fe station at Arkansas city before the run. The best music that ever came out of Texas. Now, what was this thread originally about.....?